The conflict in Iraq is on a way to settlement with emphasis being turned towards reconstruction and development of infrastructure in the country. Major sectors in the country such as chemicals, petrochemicals, fertilizers and refinery suffered significant damage during the period of conflict. Additionally, decline in oil prices, budget cuts and lack of foreign participation in construction projects further led to postponement of projects in the country, consequently, leading to declining of Iraq air conditioner market revenues. Wall mounted split air conditioner segment acquired majority of the volume share in the overall Iraq air conditioner market share, backed by complications in installation of window air conditioners in high floored apartments, along with closed spaces and higher demand for inverter models, as a result of low electricity consumption. VRF systems recorded increased adoption among large number of residential along with commercial & hospitality projects across the regions. The residential application witnessed highest number of installations followed by commercial and retail sectors. Additionally, hospitality is the largest growing application owing to development of large number of hotels across Erbil, Najaf and Karbala. The residential, hospitality, transportation and oil & gas are the key emerging applications which are likely to exhibit healthy growth opportunities in near future. The Iraq air conditioner market report thoroughly covers Iraq air conditioner market by product types, end use applications, and regions. 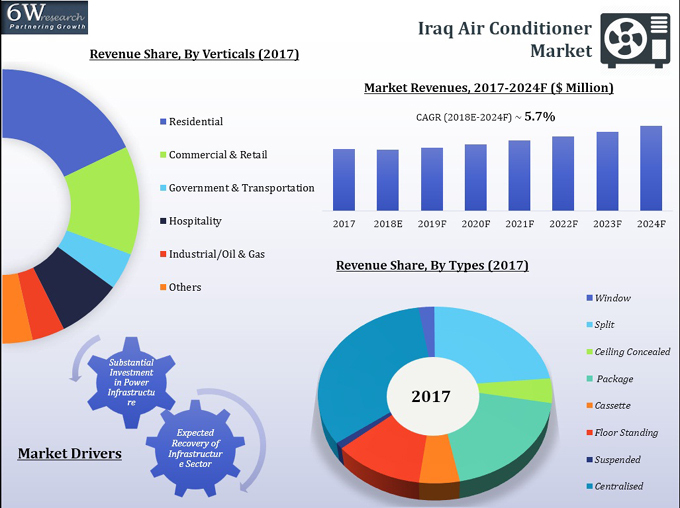 The Iraq air conditioner market outlook report provides an unbiased and detailed analysis of the Iraq air conditioner market trends, opportunities/high growth areas and market drivers which would help the stakeholders to decide and align their market strategies according to the current and future market dynamics. • Iraq Air Conditioner Market Size and Iraq Air Conditioner Market Forecast, until 2024. 19.6. Johnson Controls Air Conditioning & Refrigeration Inc.